Each serving contains 5.5g of naturally occurring BCAAs. Our easy digesting whey formula contains Tolerase, a pH stable lactase enzyme contributing to improved lactose digestion, ideal for those who have difficulty digesting lactose. 1 serving: Add 1 scoop of powder (30g) to 175ml of ice cold water and shake or blend for 10 seconds. For best results, take our delicious Blue Lab Whey throughout the day, before or after training. 26g of Protein: Mix 1 scoop (34g) into 150-200ml of cold water. 52g of Protein Double Serving: Mix 2 scoops (68g) into 300-400ml of cold water. Shake well for 30 seconds, settle for 60 seconds, shake again before drinking. Adjust your protein intake from 1-5 servings depending on your physical goal and protein requirements. 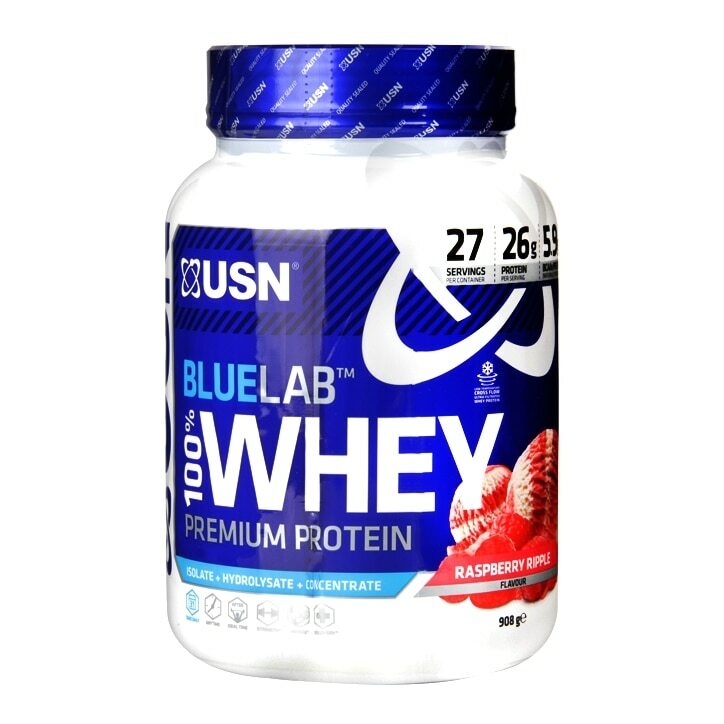 USN Blue Lab 100% Whey Raspberry Ripple is rated 5.0 out of 5 by 4.